12.5" RCOS @ ~f/9 (2880 mm fl) 0.64 arcsec / pixel. Shown at 0.64 and 1.03 arcsec / pixel. PhotoShop on-linear stretching and LRGB combine. The image is shown rotated 75° clockwise. 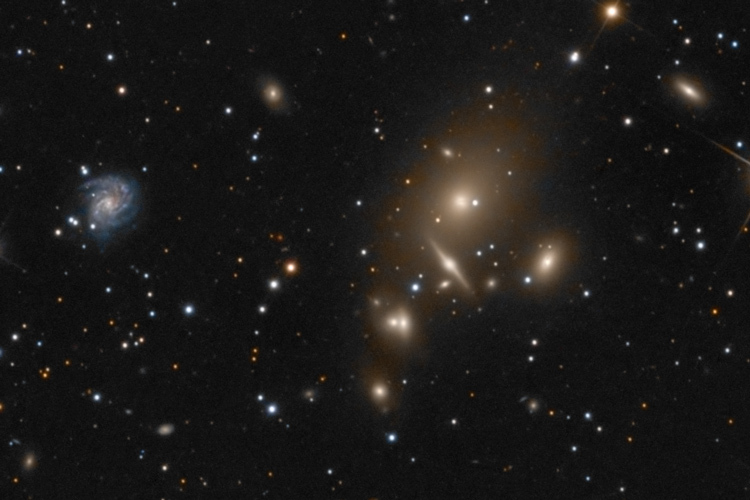 The Fath is a small cluster of galaxies, near the center of the larger cluster Abell 262. Located in the Andromeda constellation, it is at a distance of about 204 million light-years and includes NGC 703-710. The elliptical galaxy, NGC 708, dominates the cluster. The Fath is named after astronomer Edward Arthur Fath, 1880-1959. There does not seem be any historical connection between Dr. Fath and the cluster. This suggests that it is named as such, simply because the cluster looks like the letter "F."
Dr. Fath did groundbreaking research that led to determining that spiral nebulae are actually distant galaxies. For more info click here.